During her PhD studies, Prof. Abril Torres-Méndez was involved in the problem of Mobile Robot Environment Modeling. 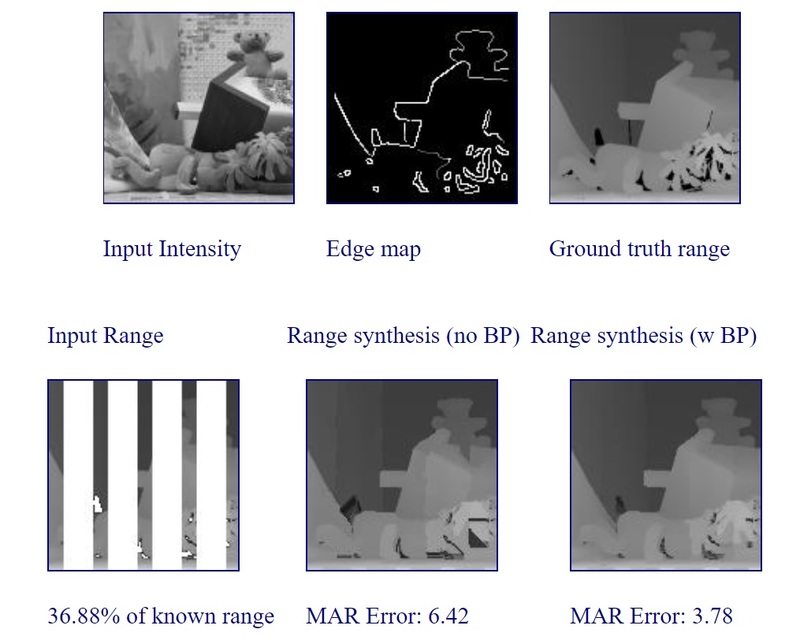 She was under the supervision of Prof. Gregory Dudek and they developed a new statistical learning method to infer the geometric structures from images. Specifically, the method computes dense range maps of locations of the environment using only intensity images and very limited amount of range data as an input. Our goal is to facilitate the building of 3D environment models by exploiting the fact that both video imaging and limited range sensing are ubiquitous readily-available technologies while complete volume scanning is prohibitive on most mobile platforms. The main idea is to exploit the assumption that intensity and range data are correlated, albeit in potentially complicated ways, but exhibiting useful structure. The scientific issue is to represent this correlation such that it can be used to recover range data where missing. Markov Random Fields are used as a model to capture the local statistics of the intensity and range. A 2002 technical report explaining more about our method can be found here.